photo courtesy of tax credits via flickr. Which piano(s) will you be visiting? What part(s) of town are you available to help load/unload a piano? Wipe the dust and dirt off the cabinet, the keys and the bench. If you think cleaner would be helpful, choose a mild cleaner without ammonia, and then spray the cloth rather than spraying the piano. Sometimes a Magic Sponge can be helpful if a key is particularly dirty. A Magic Sponge tends to leave a little residue though, so if you use one, be sure to wipe it with a cloth afterward. The more a piano is played, the longer it will continue to be playable (especially outdoor pianos). Rapidly tap every key several times (especially the less frequently played keys at the ends). 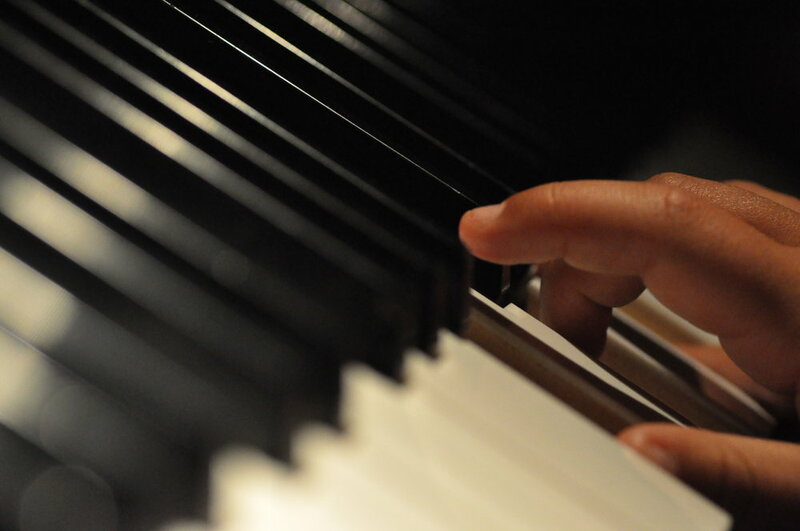 The more often you do it, the less stiff the keys will get and the better the piano will sound between tunings. The more frequently this can be done, the better! Observe anything you think that needs our attention so you can report it to us. Sometimes people aren't sure if they're allowed to play the piano. Because of that, the bench should be placed so the wording can be read when someone is looking at or walking past it. The words are an invitation to play the piano and we think that's really important. If you're at the piano and there's current or pending inclement or blustery weather, close the fallboard (keyboard cover). It goes a long way toward keeping moisture and dirt out of the piano and from between the keys. If the piano has a tarp attached to the back of it and it's raining or rain is predicted, pull the tarp over the piano as well. Whenever possible, if a storm is coming, go to the piano and close the fallboard and pull the tarp. Please pickup any litter around the piano so it doesn't look neglected. We want the pianists to feel good sitting at the piano and passersby to get a good feeling as they look and listen. Overall, it's important that the piano is a good neighbor. After you've visited a piano, please let us know. There's an orange PIANO STEWARD CHECKIN button on our home page. Even if there's nothing wrong to report, we'd really appreciate a quick checkin. That helps us spread our resources to make sure all the pianos being checked and getting the attention they need. We would love for YOU to be a Piano Steward. All you need to do to get started is to tell us which piano you'll be visiting by clicking the Sign Up button at the top of the page ! Are you an outgoing person who just loves the idea of public pianos? If you are, here's some easy things you can do to help our project while you go about you regular day. We're trying to place 88 pianos around Atlanta and the surrounding areas. If you see a great indoor or outdoor location for a piano - tell us about it! It needs to be sheltered, protected from water, free for the public to access and in an area with reasonably high foot traffic. After all, the piano needs to be played! You can educate yourself about the requirements and refer those interested to our Frequently Asked Questions page for hosts. If you see a great artist, tell us about them. And if you have the opportunity to tell them about our charity, you can refer them to our Frequently Asked Questions page for artists. Tell people about our pianos, the pianos in place and the pianos coming soon. Advocate for public pianos in general. Tell them about the joy they bring, the smiles they generate and the positive impact they make to a neighborhood. Post about our pianos, especially if you see something great happening at one of them. It could be a toddler's first exposure, a group playing and singing, or an impromptu performance. You never know what wonderful scene you might stumble upon and be able to share! Use #PMAPianos, #Public Piano, #Street Piano, #PMAPMelody, #PMAPCarly, #PMAPLiam, #PMAPHarmony, #PMAPBennett, #PMAPIrving, #PMAPAragon, #PMAPSunny, #PMAPCornelius, #PMAPDottie, #PMAPFlannery, #PMAPTommy, #PMAPHappy, #PMAPIda. Tip the piano on end. Roll a moving dolly underneath it. Strap the piano to the dolly. Roll the piano onto the truck. Cover the piano with moving blankets. Secure it inside the truck. Roll the dolly under the piano. Reach for the end of the strap as we secure the piano. Help place plywood boards on unpaved ground to create a path. Help steady the piano as we roll it. We move vertical pianos and generally won't take piano if there are more than two or three stairs and so we can use a ramp. A piano rarely needs to be carried. We need help to tip the piano to slide the dolly underneath. The center of gravity is higher and more hands are needed to steady the piano so it doesn't fall when we roll it. The good news is that we always rent a truck with a lift gate (instead of just a ramp) when we're moving a tall piano! We hire a piano tuner/technician for regular tunings for all of our pianos, but the outdoor pianos need more than that. They need a piano technician who loves the idea of public pianos. Ideally someone who passes one of the pianos on a fairly regular basis and is anxious to fix 'that sticky key' and keep it working for the community. Someone who delights in the joy of a mesmerized child who watches as you open up the piano revealing the magic inside. We envision the piano technician who adopts a piano to be someone who becomes known in the community just like the piano is, and is associated with the same good feelings. And we wouldn't be surprised if the neighborhood would come to trust that technician with their own pianos. If you're interested in adopting a piano, it would also make sense to discuss whether or not you would like to be the paid tuner for that piano as well. We'd be happy to discuss what you think might work. We're a small nonprofit charity with no fundraising expertise. Without financial engagement from the community we won't be able to continue what we do. If you're a fan of public pianos and can help in any area we would greatly appreciate it. We'll be organizing fundraising events for which we need pianists. It might be a "Piano Play Around", which would be an advertised time to meet at a piano and alternate playing songs with other pianists (whether you're a professional pianist or you just play for fun), or it could be a dueling pianos event. Or we may come up with a different idea altogether, but if you're willing to share your talent and play a piano at a fundraiser, please, come play with us! Whether it's an impromptu performance for passersby, a group piano lesson, your daily piano practice, or just trying to remember a little ditty that you learned years ago, PLAY OUR PIANOS! The more they're played, the more playable they remain. 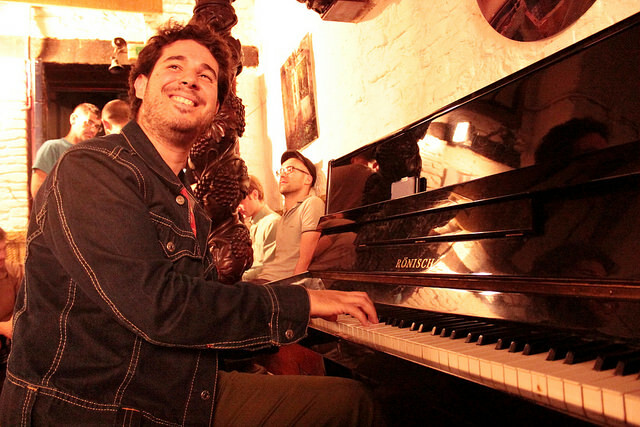 One of the best things you can do to enhance our project is to play the pianos - it spreads the joy and makes the magic.